This round of currency devaluations is unlikely to help anyone. Despite spending an estimated $200 billion to prop up its stockmarket, Chinese stocks have crashed 43 percent on a peak-to-trough basis, after previously doubling in a year. Chinese authorities reportedly arrested nearly 200 people for spreading stockmarket rumors, including broadcasting a televised confession from journalist Wang Xiaolu. Yet according to Zhu Jun, head of the international department at the People’s Bank of China, the market turbulence in China, including the massive stock sell-off, should not reoccur. Responding to concerns over the growth prospects of the world’s second-biggest economy, Chinese Finance Minister Lou Jiwei told the G20 meeting that its economy would grow around the 7 percent mark “for the next four to five years.” According to Japan’s Kyodo news agency however, he indicated that the nation’s current “tough times” could extend for 10 years. U.S. Treasury Secretary Jacob J. Lew reportedly told his Chinese counterpart that China “should avoid persistent exchange-rate misalignments and refrain from competitive devaluation,” Bloomberg said. 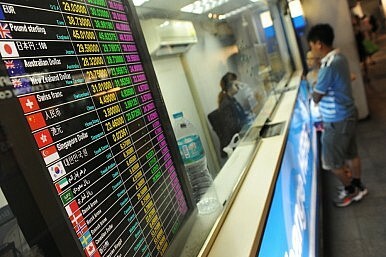 Yet China has not been the only Asian economy to use its currency as a tool of economic policy. As previously noted by Pacific Money, Vietnam has already devalued its currency three times this year, the latest on August 19, responding to the threat of “negative impacts” from the U.S. Federal Reserve’s much-anticipated policy tightening. China’s foreign exchange reserves have dropped by an estimated $315 billion in the year to July 2015, while the reserves of Indonesia and Malaysia have dived this year amid a deepening “trade recession” in Asia. Japan has also continued its policy of massive quantitative easing, with the side effect of a weaker yen, while Australia’s dollar has dropped to a six-year low against the U.S. dollar amid calls by the nation’s central bank governor for a cheaper currency to boost exports. “We risk slipping into a beggar thy neighbor, competitive spiral of currency devaluations, with all the currency overshoots and volatility that go with that,” Mohamed El-Erian, chair of U.S. President Barack Obama’s Global Development Council, told the Financial Times (FT). According to the analysis, having a weaker currency “did not lead to any rise in export volumes. However, it did lead to a fall in import volumes of about 0.5 percent for every 1 percent a currency depreciated against the dollar.” This is because a cheaper currency increases the cost of imports, resulting in lower demand for imported goods. Capital Economics estimates Brazilian import volumes have fallen at a pace of 13 percent year-on-year for the past three months, following a 37 percent drop in its currency over the previous year. Other countries such as Russia and South Africa have seen similar falls in imports in the wake of sinking currencies. “This suggests emerging market countries can improve their current account balances by letting their currencies weaken, but only as a result of importing less, not exporting more, leading to a vicious cycle of falling global trade and an army of losers, but no winners,” the British financial daily said. While similar patterns were seen during the Asian financial crisis of 2007-8, the worry for global trade is that the currency depreciations have been more widespread and emerging markets now account for a greater share of global GDP, magnifying the impact. According to Capital Economics, Asian import volumes are currently down 1.5 percent year on year, while ANZ Research has pointed to the current negative year-on-year export growth for the region. World trade contracted in the June quarter, with the International Monetary Fund’s managing director Christine Lagarde warning the G20 of increasing “downside risks,” particularly for emerging market economies. Emerging market corporate debt has more than doubled in U.S. dollar terms in China, Indonesia, Taiwan, Thailand and other emerging markets since 2008, highlighting the risk of further Asian currency weakness against the U.S. dollar. Meanwhile, there has been increased equity flows out of emerging markets, with non-resident portfolio flows in such markets turning negative last month for the first time this year, according to the Australian Financial Review. Amid improved U.S. economic growth, market pundits are pointing to a likely policy change at the Fed’s September 16-17 meeting, which would mark the first U.S. rate rise in nine years. With the G20 still seeking to pursue the 2014 Brisbane summit’s reform targets in a bid to restore global growth, avoiding a costly currency war could prove vital for Asia’s emerging economies in preventing a harder landing. The recent weakening of the yen is sparking responses across the region.